The Insider | Why U.S. Government uses occult symbols in Great Seal printed on dollar bills? WHY DOES THE U.S. GOVERNMENT PRINT ANCIENT MASONIC SYMBOLS ON EACH AND EVERY ONE-DOLLAR BILL? The American dollar bill is probably the world's best known banknote, but how many people appreciate why the Great Seal of the United States of America is printed on it, or understand what these ancient symbols mean? "On July 4, 1776, the Continental Congress passed a resolution authorizing a committee to devise a seal for the United States of America. This mission, designed to reflect the Founding Fathers' beliefs..."
The symbols of the Great Seal, which are featured on the dollar bill, are clearly intended to embody the beliefs of those who founded the United States of America. The current design of the Great Seal was approved by Congress on 20 June 1782, and the seal was introduced to the dollar bill in 1935. The continued official use of Masonic symbols today indicates that these beliefs remain at the heart of the U.S. establishment. What were the beliefs of the founders of America? Numerous sources [apparently] outside Freemasonry report that the vast majority of the American founders and signatories of the U.S. Constitution were Freemasons. Anti-Mason material routinely claims that almost all of America's founding fathers were members of a Masonic Order. Official sources within Freemasonry counter-claim that some but not all of America's founders were Freemasons, and point out that the Masonic status of many of the alleged Masonic founding fathers cannot be proven conclusively. The aforementioned school of thought is corroborated by well-documented reports from some authoritative Masonic sources; thus, Manly Palmer Hall, a thirty-third degree Mason, wrote: "Of the fifty-five members of the Constitutional Convention, all but five were Masons." One side of the Great Seal shows an ancient Egyptian pyramid, beneath a triangle containing a glowing eye. The shining eye in the triangle is a certainly a famous and common Masonic symbol, although some Masonic sources prefer to deny this. The	All Seeing Eye (e.g. 1, e.g. 2, e.g. 3, e.g. 4, e.g. 5, e.g. 6, e.g. 7, e.g. 8, e.g. 9, e.g. 10) is one of the most important and spiritual Masonic symbols, and the distinguished Freemason George Washington, first President of the United States of America, wore it emblazoned boldly on his Masonic apron. The front of the Great Seal displays an Eagle, which is also an important symbol in Masonic traditions. The use of the blazing eye in the triangle motif, surrounded by rays of light, in the official seal of the Ordo Templi Orientis, confirms the occult significance of this symbol. The sacred number 13 is encoded in the Seal, in the the bundle of thirteen arrows, the thirteen stripes on the shield, and the thirteen stars of the constellation that can be joined to form the Star of David shining above the Eagle's head. 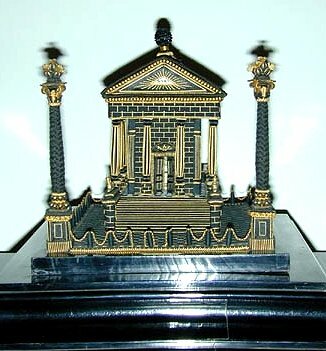 The reverse, sometimes referred to as the spiritual side of the seal, contains the thirteen-step pyramid with the year 1776 in Roman numerals on the base, heralding the beginning of the new American era. Incidentally, every American state has its own official State Seal. For instance, the Great Seal of the State of Colorado bears the ubiquitous radiant eye inside the triangle, together with other relevant symbols. 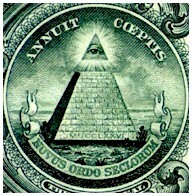 The motto inscribed beneath the pyramid in the Great Seal of America is "Novus Ordo Seclorum" which is Latin for "New Order of the Ages", and synonymous with the "New World Order". The momentous decision to print the Great Seal on the dollar bill was taken in the 1930s by the government minister Henry Agard Wallace (1888-1965), who later became Vice-President of the United States, second in command to President Roosevelt, from 1940 to 1944.
inaugurating 'the New Order of the Ages'." It is difficult to elucidate the full meaning of the symbols in the official Great Seal of the United States, because they are occult symbols which carry profound esoteric meaning from a truly ancient secret society which may be older and more far-reaching than the Masonic order. There are various interpretations in the public domain, but the truth is known only to initiated insiders. What is most important in the context of this article is that these are ancient religious symbols which hold special hidden significance, and their use by the American government reveals something about the secret beliefs of those in power. 1. Federal Consumer Information Center website, page about the Great Seal of the U.S.
2.a. Still, W. T., 1990. 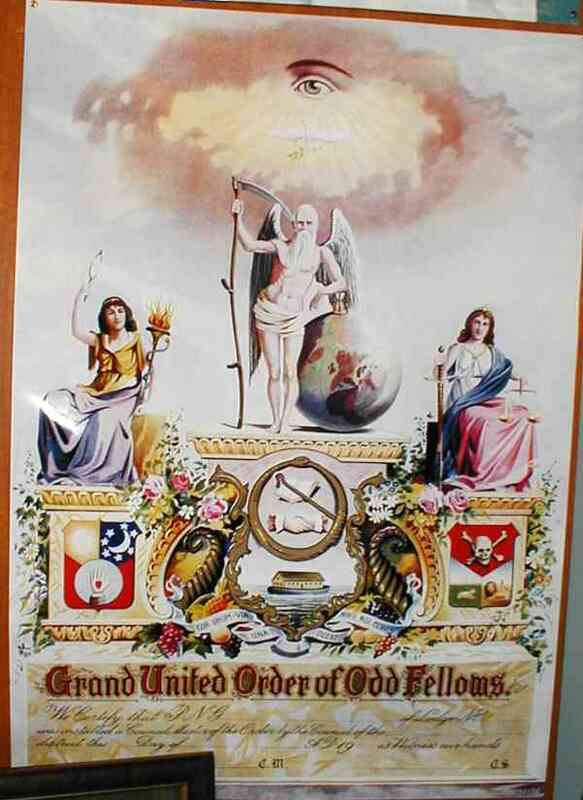 New World Order: The Ancient Plan of Secret Societies Louisiana, USA: Huntingdon House, p 61. 2.b. Picknett, L. & Prince, C., 2000. The Stargate Conspiracy: The Truth About Extraterrestrial Life and the Mysteries of Ancient Egypt. New York, USA: Berkley Publishing Group. 3. Hall, M. , 1951. America's Assignment with Destiny. Los Angeles, USA: Philosophical Research Society, pp 96-97. 4. MacDonald, Dwight, 1948. Henry Wallace: The Man and the Myth.. New York, USA: Vanguard Press, p116. 5. Wallace, Henry A., 1934. Statesmanship and Religion. New York, USA: Round Table Press, Inc, pp 78-79.